Now Playing in a giant screen theater near you. Imagine swimming alongside some of the most graceful and extraordinary creatures on earth - wild dolphins. Dive in with two scientists studying these elusive animals in the crystalline waters of the Bahamas and wind-swept seas of Patagonia. From the producers of Everest, comes the next Great Adventure Film – narrated by Pierce Brosnan and featuring a soundtrack with songs and music from multi Grammy Award® winner Sting. 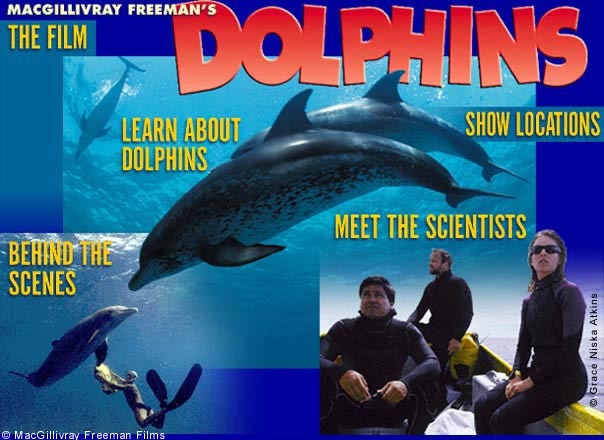 MacGillivray Freeman’s Dolphins now playing or coming soon to a giant screen theater near you. One World One Ocean: The One World One Ocean Campaign is a MacGillivray Freeman Films initiative powered by MacG Media that is harnessing the power of IMAX films, feature films, TV, and new media to change how people see and value the ocean. Grammy Award® is a registered trademark of the National Academy of Recording Arts and Sciences. "Great Adventure Film Series" is a registered trademark of MacGillivray Freeman Films, Inc."